Call Us A Cab - An acoustic/electric music performance trio playing familiar and unexpected, classic to current tunes in the Denver area. Call 303-741-0940. Don't let our name fool you! 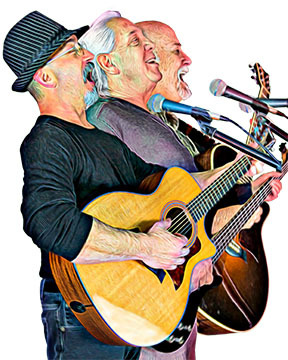 Call Us A Cab is an acoustic/electric music performance trio playing familiar and unexpected, classic to current tunes, in the Denver area. We hope you'll enjoy our sound as much as we do creating it for you. After the huge success of my corporate event last night (due largely in part to this incredible trio), Call Us A Cab is my new go-to band for all of my events where we want live music. Not only are they amazingly talented, they are amazing to work with as well. Incredibly responsive and reliable. Still humming fantastic classics in my head today after a GREAT party last night! "Call Us A Cab" doesn't play originals because they know you would rather hear songs as recorded by chart-topping artists. So when you come to see Call Us A Cab, you'll hear songs you know and love - simple, beautiful songs that will touch your heart, as well as slightly more rowdy tunes that everyone in the room is very likely to turn into a grand old sing along. Local Denver area breweries, restaurants and private events are our favorite venues. Click here to see where we've been playing.